Sukku or dry ginger is good for digestion.Its comfort for cold and cough. 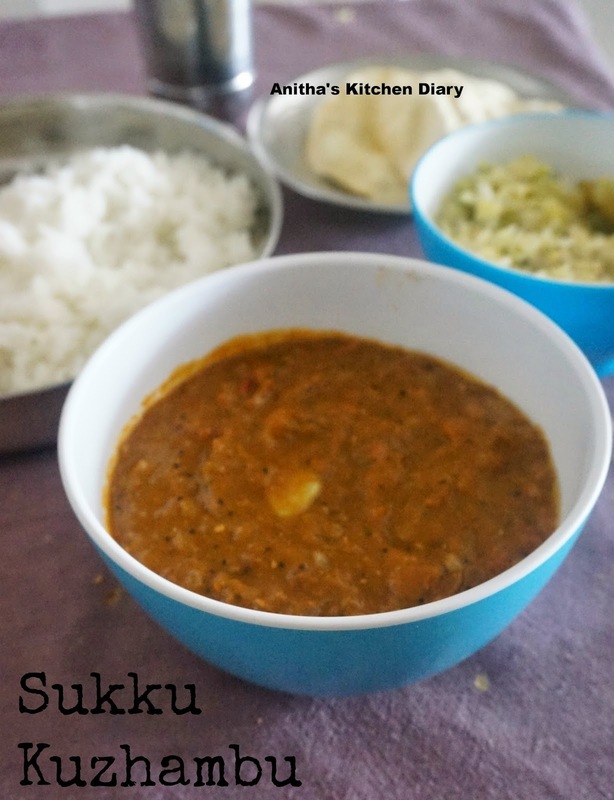 This tangy sukku kuzhambu is perfect papad or any kootu. Extract tamarind juice and dilute with water to make it 1 to 1 1/2 cups. Dry roast the sukku in a pan and let it cool down. Once cool down blend it in a blender and keep aside. Heat oil in a pan,add mustard seeds ,fenugreek seeds and curry leaves. Once splutter add garlic and fry for 2 minutes. Now add onion and cook til it translucent. Add tomato , turmeric powder and some salt. Cook till tomato turns mushy. Add sambar powder , tamarind juice and required amount water and salt.Let it boil until it reaches thick consistency. Simmer the flame ,add sukku powder and let it boil for a minute and switch off the flame. Serve it with rice or with Idli dosa. If become too spicy add few drops sesame oil to the gravy.